Bordeaux is the largest wine growing area in France, located in the south west of the country. The region is divided into left bank and right bank by the Gironde River. Left Bank blends tend to be higher in tannin, alcohol and acidity than blends on the right bank, and are generally more powerful and rich. Right bank blends tend to be softer, less tannic and lower in alcohol and acidity. Large proportion of wine produced in Bordeaux is a red blend traditionally known as claret, ranging from medium-bodied to full-bodied, followed by sweet white wines (Sauternes) and dry whites. The climate of Bordeaux is a moderate maritime climate. Weather is inconstant due to insufficient warmth during ripening period or excessively rain at the harvest time, giving distinctive annual vintage variations. The high humidity can also cause mold and rot problems, though mists and autumn rain are essential for the creation of noble rot essential for the production of the highly sought-after Sauternes wine. 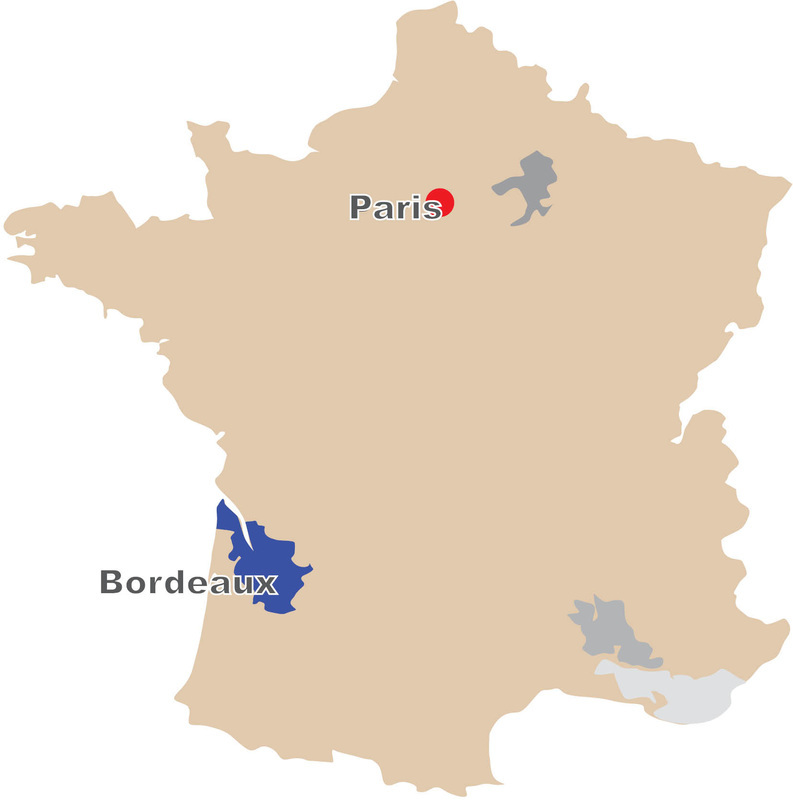 The soil of Bordeaux is composed of gravel, and clay with limestone subsoil. The majority of Bordeaux wines are dry, medium-bodied reds that made the region famous. Apart from the famous chateaux of the Medoc, particularly those in Pauillac and Margaux, and from the Saint-Emilion and Pomerol, there are as well many potential chateaux, which possess high quality wines, situated between the left bank and right bank and around the major appellations. The most common grape varieties for reds are Merlot and Cabernet Sauvignon, while for whites are Semillon and Sauvignon Blanc.